If you’re a kpop fan, I bet you surely know all the terms used in Kpop world! :p Whoever ask me who is my Kpop bias, you will always get the same answer – BigBang! 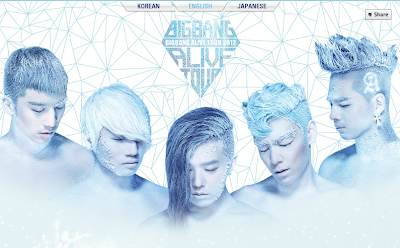 <3 For this, I just can’t wait till this coming 27th October for their concert at Malaysia! I’ve get to know about BigBang through my sister Flo and also the bestie back at college time. I still remember how I get hooked up by the song – Lies and also Sunset Glow by BigBang – at that time. Since then, I started to stalk their updates as well as check on everything about them. Just so you know that I can be a great stalker too when come to stuff or people I get obsessed with. 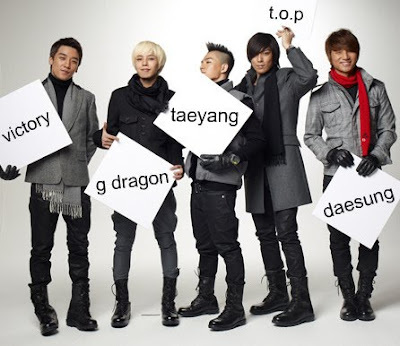 Big Bang (빅뱅) is a Kpop group of five members - G.Dragon (Leader), T.O.P, Taeyang, Seungri and Daesung - with each played different roles on vocal or rapping parts. When they first debuted, they were considered to be the new face of the YG Family, a pet name for their management company YG Entertainment. Although their debut was somewhat successful, it was not until the release of “거짓말” (“Lies”) which stayed on the Korean chart for the seven consecutive weeks that made the group gained success. Both G Dragon and dancer Taeyang were the first ones to received training under YG Entertainment at the age of eleven.They were child models first cast as the younger version of YG artist Jinusean in their music video "A-YO", but later CEO Yang Hyun-Seok took notice of their talent in music and dance. As a rapper, G-Dragon also participated in promotional activities with YG Family at fourteen years old. T.O.P was an underground rapper under the stage name "Tempo". 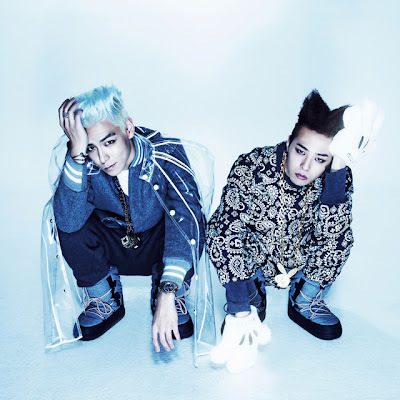 G-Dragon contacted T.O.P, with whom he was childhood friends, when YG Entertainment was scouting for candidates to create a boy group.The pair recorded several demos and sent them to Yang Hyun-suk, who later asked T.O.P to audition. However, he was rejected by the record label because he was deemed too "chubby" to fit the "idealistic version" of an idol. Six months later, he was recruited after losing weight. T.O.P reportedly lost 20kg(44 lbs) in forty days. Seungri was a leader of a local dance team in his hometown, Gwangju. He first appeared on the reality television series Let's Cokeplay: Mnet Battle Shinhwa, a show in which idol group Shinhwa search for members to make up the "second-generation Shinhwa". His lack of vocal skills did not charm the panel and led to his elimination from the Top 4. He then auditioned and was accepted to train under YG, but in Big Bang's Documentary series, it was revealed his position was in jeopardy but he later impressed CEO Yang Hyun-suk and made the cut. At the time, Seungri competed against another trainee, Hyunseung (now of BEAST fame), who was cut from Big Bang. Daesung was recruited in an open audition. He is well known for his strong singing ability. He was trained under Wheesung's supervision. Big Bang held their debut on August 19, 2006 at the Gymnastics Arena in Seoul Olympic Park during the YG Family 10th Year Concert. On September 23, 2006, the group had their debut performance on television broadcast. Following the performance, the group's first single, Bigbang, was released. It contained the songs "We Belong Together", featuring labelmate Park Bom; "A Fool's Only Tears" and "This Love", an adaptation of the American rock band Maroon 5 song, rewritten and performed by G-Dragon.The single went on to sell nearly 40,000 copies. The second single, BigBang Is V.I.P, was released in September, eventually topping 32,000 copies sold. 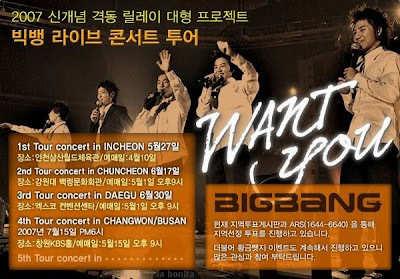 Their last single, Bigbang 03, followed, with final sales nearing 40,000 copies.At the end of December 2006, Big Bang held their very first concert, The Real. The following month, their debut album, Since 2007, was released, selling 48,000 copies by the end of February 2007. The year of 2007-2008 marked their yet another successful year for Big Bang! That's the year when they released their liver concert album, began their Want You Tour. With the great respond from the first mini-album, they also released second mini-album and another concert - Big Bang Is Great concert! At the end of 2007, it was reported that members of the band were hospitalized from over-performing and exhaustion, halting their promotional activities. Reports were later released that Big Bang's albums and singles were in very high demand, causing the record company to reprint and repackage them for re-release.Riding on the success of their mini-album, the group collected numerous awards, including "Best Male Group" and "Song of The Year" from the 2007 Mnet Asian Music Awards.They later received the "Artist of the Year" award from the 17th Seoul Music Awards. As 2007 came to a close, Big Bang ventured overseas to Japan. Their first Japanese extended play, For the World, released in early 2008, charted at number 10 on the Oricon chart with a little promotion only. Big Bang also released the Japanese song, Number 1, from their album of the same name, performing the song on Japanese radio programs and TV shows, the album peaked at number three on the Japan's Oricon daily album chart. Their Korean follow-up album, Remember, also released in 2008, yielded the number 1 single, "Sunset Glow". "Strong Baby", performed solely by Seungri, was released as the second single. The album went on to sell over 200,000 copies.Big Bang received their second "Artist of the Year" award from the 2008 Mnet Asian Music Awards. 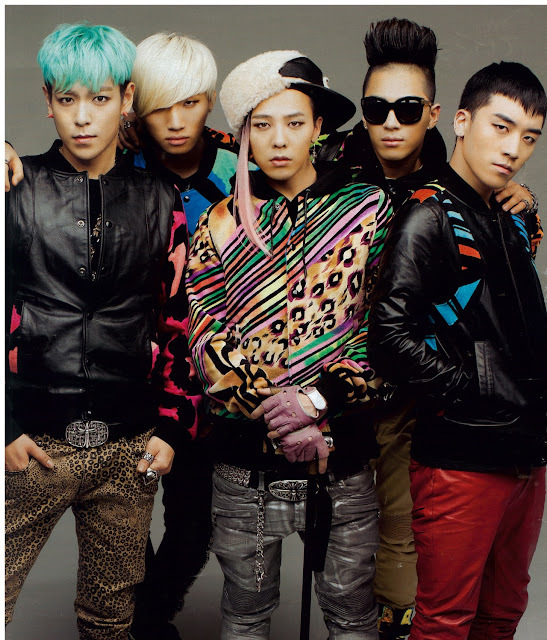 At the end of 2008, it was reported that Big Bang earned a total of ₩36 billion ($24.5 million). With the group on break in early 2009, the members pursued solo activities. Their first self-titled full-length Japanese album was released under Universal Music in August 2009 and was promoted with two singles: My Heaven and Gara Gara Go!!. After their return to Korea, the members went back to their solo activities. On August 18, G-Dragon released his debut album, Heartbreaker, promoting it with the album's title track. The album went on to win the "Album of the Year" at the 2009 Mnet Asian Music Awards, selling over 210,000 units. Taeyang released two digital singles, "Where U At?" and "Wedding Dress" to promote his second album released in 2010. T.O.P joined the cast of the Korean thriller drama Iris, playing the assassin Vick.Daesung and Seungri both perused various individual activities in acting and hosting. For most of the year, the members individually promoted their own solo works and solo activities, including the release of the GD & TOP unit with their collaboration album and the release of Seungri's first mini-album entitled VVIP. Big Bang also won several notable awards, including the Best 5 New Artists award from the 24th Japan Gold Disc Awards as well as the "Best New Artist" award. Near the end of May, the group received the awards for "Best Pop Video" and "Best New Artist" from the MTV Video Music Awards Japan 2010. They released their latest Japanese single Beautiful Hangover on August 25, 2010. After nearly two-year hiatus as a full group, Big Bang returned to South Korea with their 2011 Big Show concert. They also showcased songs from their latest extended play Tonight ,which went on to become a chart-topper upon its release on many Korean music charts. The album also became the very first K-pop album to reach the Top 10 on US iTunes chart and is the only non-English language album in the Top 100. The album had a pre-sale order of 10,000 copies in Cyworld, beating the record set by TVXQ's 6,500 copies back in 2008. 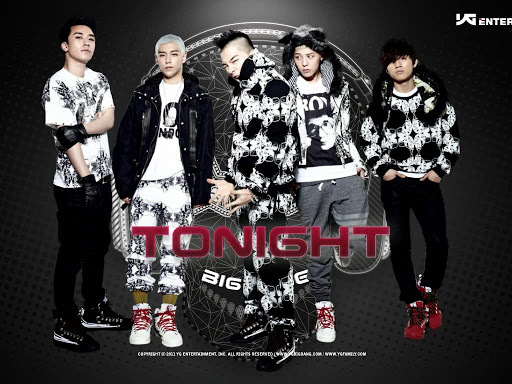 Seven days after the album's release, it was reported that Big Bang had already earned ₩7 billion (USD$6.2 million). In just a week, 100,000 copies of the album were sold. After promotions for Tonight was finished, Big Bang released a special edition album with two new tracks: "Love Song" and "Stupid Liar". "Love Song"'s music video on YouTube gained 2 million views within just two days. Big Bang won the 2011 MTV EMA's "Best Worldwide Act" award as representatives of the Asia-Pacific region with over 58 million votes. All five members were present at the awards show to receive the award, making it especially memorable since it was Daesung and G-Dragon's first public appearance since Daesung's car accident and G-Dragon's accused marijuana scandal. On November 29, the group also won the award for "Best Music Video" award with their "Love Song" music video at the 2011 Mnet Asian Music Awards. And...Big Bang's member Daesung made his first stage appearance since his car accident involving the death of a motorcyclist in late May there. The album release coincided with their annual concert, Big Show 2012, held at Seoul Olympic Park Stadium from March 2–4 to a sold-out crowd of 40,000 fans. This marks the official kick off of their first world tour BIGBANG Alive Galaxy Tour 2012 in partnership with Live Nation. It is directed by renowned choreographer Laurieann Gibson and will be stopping on 5 continents, 16 countries, and 25 cities. Concert footage from Big Show was broadcasted in 160 countries through MTV World Stage, which pushed the promotion for their world tour.Beginning from January 20, 2012, YG Entertainment began releasing teasers for Big Bang's 5th mini-album Alive, which was released in both digital and physical formats on February 29. 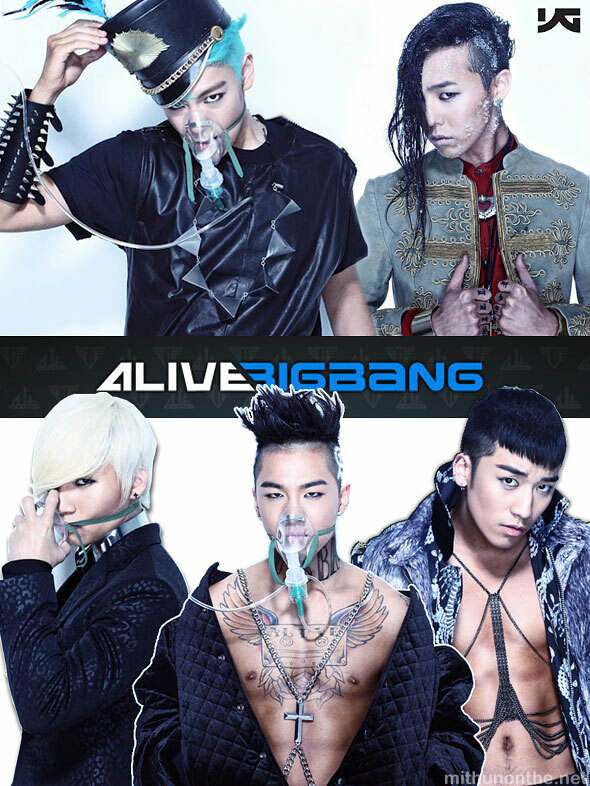 Since the release of Alive, Big Bang has received recognition from notable sites such as Rolling Stone, Ebony Magazine, Time Magazine, and a photo was featured on the Grammy Awards homepage. Following the success of their comeback, Big Bang released a repackaged edition of their mini-album Alive, titled Still Alive, on June 3. It featured Korean remakes of the two additional tracks in the Japanese version of Alive, as well as two new tracks of which their lead single was titled Monster. Their repackaged mini-album also performed commercially well, selling over 100,000 copies in its first month of release. A special edition of their Japanese Alive album was also released following its Korean counterpart, titled Alive -Monster Edition-. The success of the repackaged album further boosted the group's global recognition, peaking just outside of the Top 10 at #11 on the Billboard Social 50. Oh wait! 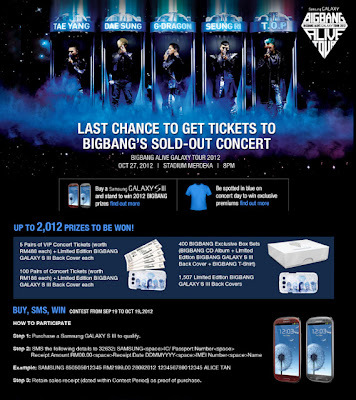 Have you gotten your Big Bang concert tickets? If you haven’t, do check out here! **Contest period from 19th Sept 2012 to 19th Oct 2012. 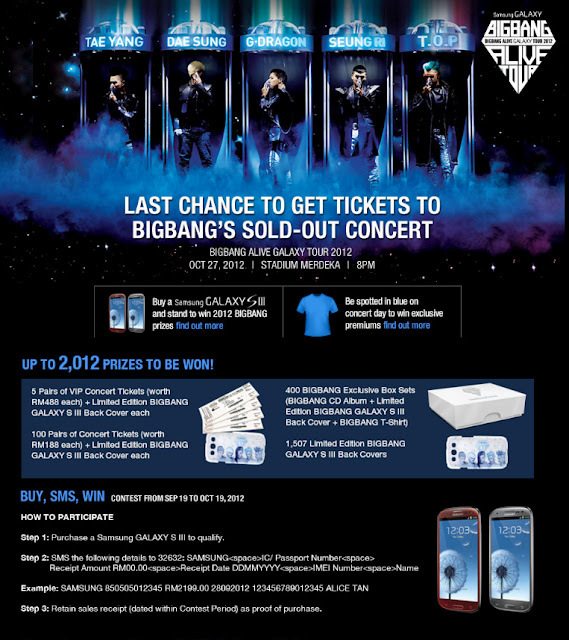 If you already have your BigBang concert tickets, please wear in BLUE as you can win exclusive premiums including BigBang LED Bangle or Party Gifts (while stocks last). For more goodies and latest news, visitSamsung's BigBang Facebook Apps here and Samsung Mobile Malaysia Facebook Page.